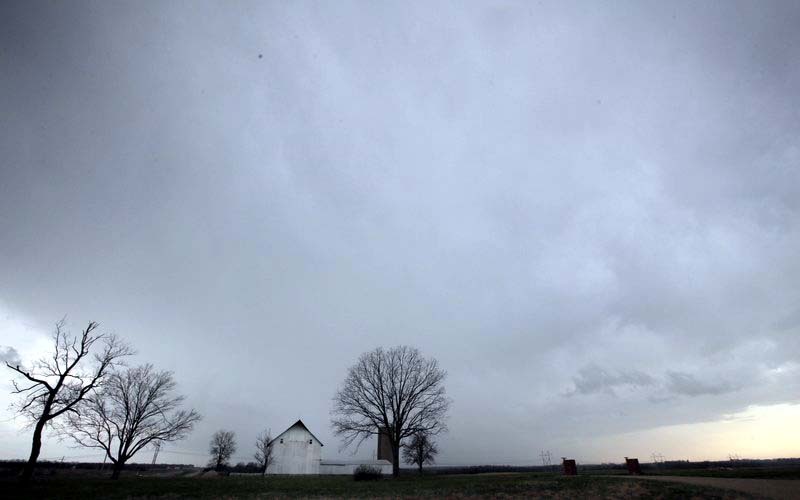 A potent spring storm system that’s expected to persist through the weekend raked across the Midwest, spawning at least one tornado in Arkansas as blizzard conditions blanketed much of the Northern Plains. Video from the scene showed uprooted trees, overturned cards, damaged buildings and downed power lines. The huge storm, packing enough energy to cause widespread disruption, isn’t unprecedented for April, said Jake Beitlich, a meteorologist with the National Weather Service in Chanhassen, Minnesota. Blizzard warnings stretched from northern Kansas across most of Nebraska and South Dakota into southwestern Minnesota and northeastern Iowa, with winter storm warnings and watches covering most of the rest of Minnesota, Wisconsin and Michigan. Heavy snow already blanketed parts of western Kansas, Nebraska and South Dakota by early afternoon Friday, closing major highways in South Dakota and many roads and highways in western Nebraska — including a 200-mile stretch of cross-country thoroughfare Interstate 80 from North Platte west to the Wyoming border. A road conditions report said most roads in the Nebraska Panhandle to east of Valentine in the northern part of the state were impassable because of heavy snow cover. The snow also led officials to shut down the Sioux Falls, South Dakota, airport Friday afternoon through Saturday night. Snow, freezing rain and high winds were expected through Saturday night, with heavy ice accumulations in parts of Michigan through Sunday morning. A swath of southern Minnesota, including Minneapolis though northern Wisconsin, was expected to get 8 to 12 inches of snow or more. Parts of northern Nebraska could get up to 18 inches, with up to 12 inches in northwestern Iowa. Wind gusts of up to 50 mph will make travel hazardous. The National Weather Service’s Storm Prediction Center in Norman, Oklahoma, had issued tornado watches Friday for eastern Texas and western Louisiana, moving up through eastern Oklahoma, Kansas, Arkansas and into Missouri and Iowa. The weather service also warned of the potential for strong thunderstorms, large hail and damaging winds for Arkansas, Oklahoma, Louisiana and eastern portions of Texas. In Conway, Arkansas, strong winds caused damage at several buildings at the University of Central Arkansas on Friday. The school said on its Facebook page that students were evacuated from an all-female freshman dormitory after its roof was damaged. No injuries were reported. In Mountain Home in northern Arkansas, authorities evacuated a nursing home after its roof was severely damaged by heavy winds. Police said no injuries were reported. The threat of severe weather prompted officials with the French Quarter Festival in New Orleans to cancel all of Saturday’s events, held outdoors across 23 stages scattered throughout the historic neighborhood. Organizers said the festival will reopen for its final day on Sunday at 11 a.m. Forecasters said Alabama was also at risk for a weekend of severe weather, with the National Weather Service predicting storms beginning over north Alabama early Saturday will create a threat of winds up to 60 mph and tornadoes through Sunday. The Storm Prediction Center said there’s an enhanced risk of bad weather in an area that includes Birmingham, Huntsville and Mobile, and that Montgomery is on the fringe of the risk area. Severe thunderstorms also popped up to the north Friday morning in parts of Wisconsin, Minnesota and South Dakota. Golf ball-sized hail fell Friday morning in parts of southwestern Wisconsin, covering the ground like snow in Richland Center and Gays Mills. Large hail also fell in Parker in southeastern South Dakota while pea-sized hail fell in nearby Sioux Falls. “That that just kind of again speaks to how strong the system is, where you’re going to get a lot of snow on the cold side, and severe thunderstorms in the warm part of the storm,” Beitlich said. In South Dakota, where a blizzard warning covered much of the state, authorities issued no-travel advisories for many highways and closed much of Interstate 90 in the western half of the state. Gov. Dennis Daugaard closed state government offices in 32 counties ahead the approaching blizzard. Dozens of school districts canceled classes ahead of snow accumulation expected to reach as much as 18 inches in some areas. Rapid City had already received 5.5 inches by 10 a.m. Dangerous fire weather conditions in Oklahoma contributed to wildfires that forced hundreds of people to evacuate their homes near Woodward, about 125 miles (200 kilometers) northeast of Oklahoma City. Emergency crews in western Texas were also battling wildfires amid forecasts of extreme fire danger.